"It's My Party" is a pop song recorded by multiple artists since the 1960s. In 1963, American singer Lesley Gore's version hit number one on the pop and rhythm and blues charts in the United States. It was the first hit single for producer Quincy Jones. The song lyrically portrays the discomfiture of a teenage girl at her birthday party when her boyfriend Johnny disappears, only to surface in the company of Judy, another girl, who is "wearing his ring," to indicate she's replaced the birthday girl as his love interest. The song's chorus, "It's my party, and I'll cry if I want to... You would cry too if it happened to you!" became a part of American pop cultural language as a phrase used to describe being utterly humiliated and miserable during an event that is supposed to be a happy occasion. "It's My Party" is in the key of A major. The song's effectiveness is enhanced by several musical touches producer Quincy Jones incorporated, including Latin-sounding rhythms, double tracked vocals and effective horn parts. Allmusic critic Jason Ankeny wrote of the song, "'It's My Party' remains one of the most vivid evocations of adolescent heartbreak ever waxed—Quincy Jones produced the record, although you'd swear it was Aaron Spelling instead." "It's My Party" was credited to John Gluck, Wally Gold and Herb Weiner, staff writers at the Aaron Schroeder Music firm in 1962. The lyrics were actually written by Seymour Gottlieb, a freelance songwriter. He gave the lyrics to Herb Weiner, with whom he partnered in writing songs, to peddle. It was based on actual events relating to Gottlieb's daughter Judy's ‘Sweet 16’ party, before which she cried over the prospect of her grandparents being invited. The demo for the song was cut by Barbara Jean English, a girl group veteran (the Clickettes, the Fashions), who was then working as a receptionist at the firm. She also worked with Jimmy Radcliffe, serving as the firm's in-house demo singer. Radcliffe produced the demo, and, according to English, "tried to persuade Musicor [the label owned by Aaron Schroeder] to release it as a record, or to take me into a master studio and redo it, but they weren't interested." The first recording of the song was in 1962 by The Chiffons for their One Fine Day album. It was also recorded by Helen Shapiro for her Helen in Nashville album in February 1963 with Shapiro's regular producer, Norrie Paramor, and also Al Kasha. Shapiro would recall: "Right from the first time we heard the song on the rough demo back in London, we thought we were going to sock them between the eyes with that one"; however, Shapiro's version was not one of the cuts chosen as an advance single from the album and by the time of the album's release that October the "It's My Party" track was perceived as a cover of Lesley Gore's hit. 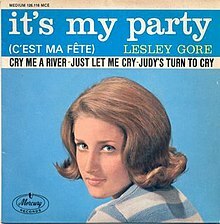 Lesley Gore recalls that "It's My Party" was among some two hundred demos producer Quincy Jones brought to review with her in the den of her family home in February 1963. On hearing "It's My Party," Gore told Jones: "That's not half bad. I like it. Good melody. Let's put it on the maybe pile." The song proved to be the only demo Gore and Jones found agreeable. 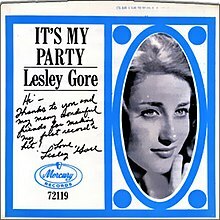 With Jones producing and Claus Ogerman handling arranging and conducting duties, Gore recorded 'It's My Party' at Bell Sound Studios in Manhattan on March 30, 1963. In March 1963 Phil Spector heard the demo of "It's My Party" while visiting Aaron Schroeder's office. Wally Gold would recall: "He [Spector] said, 'Great, I love it. I’m gonna do it with the Crystals.' We [the song's writers] were really excited, because that would ensure that the record was #1!" Schroeder apparently only learned of the Lesley Gore recording of "It's My Party" when Quincy Jones invited him to hear the completed track, which Schroeder found formulaic; believing that Spector would be able to cut a much stronger version of the song with the Crystals and not wanting to lose Spector's good will, Schroeder attempted to convince Jones to suppress the track. Schroeder did not mention Spector's version to Jones but Jones and Spector both happened to attend a concert with Charles Aznavour at Carnegie Hall on the evening of March 30, 1963 and when they met outside it came up in conversation that Spector had recorded a version of "It's My Party" with the Crystals. [note 1] Jones skipped the concert instead spending that night—a Saturday—at Bell Sound Studios making a test pressing of the track comprising one hundred copies. In 1980, WCBN-FM, the University of Michigan freeform student radio station, played "It's My Party" for 18 hours straight the day after Ronald Reagan was elected. In 1981, a remake by British artists Dave Stewart and Barbara Gaskin was a UK number-one hit single for four weeks, becoming the first version of the song to reach number one in the UK. The cover also reached number one in Ireland and New Zealand and reached the top 10 in Australia, Austria, Germany, South Africa, and Switzerland. The music video for the Stewart/Gaskin version contained a cameo by Thomas Dolby as Johnny, Judy being played by Gaskin in a blond wig. In 2017, American metalcore band Motionless In White parodied "It's My Party" for the chorus in "Necessary Evil", featuring Jonathan Davis, with lyrics altered to "It's my party and I'll die when I want to/Die when I want to/Die when I want to". Melanie Martinez used the verse "It's my party" in her hit song "Pity Party." The Paris Sisters recorded a version of "It's my Party" which was slower than Gore's version. In 1963, a Swedish-language version of the song, "Leva livet", with lyrics by Stikkan Anderson, reached number five in the Swedish hit parade Svensktoppen and became a signature song for the singer, Lill-Babs. In 1963, Richard Anthony sang a French version of the song called "C'est ma fête" on Columbia Records. Donna Reed sang a cover version of the song on the 1966 series finale of The Donna Reed Show. Bryan Ferry covered the song for his 1973 album These Foolish Things. In 1977, Carroll Baker had a number one country hit in Canada with her version of "It's My Party". In 2004, German pop group Preluders covered the song on their album Prelude to History. Amy Winehouse covered the song on Quincy Jones' 2010 album Q Soul Bossa Nostra. Icona Pop sampled the song on their 2014 song "My Party", featuring Ty Dolla Sign. Because of the pop cultural obsession with the song and its tragic nature, Gore recorded a sequel, Judy's Turn to Cry. In this song, the teenage girl narrator gets her revenge on Judy. In the lyrics the narrator explicitly finds "foolish" how much she cried when she saw Johnny and Judy together, and seems determined to start anew. But after she kisses another boy at another party, Johnny gets jealous, punches the other boy and returns to her. Following just two months on the heels of "It's My Party," the sequel reached number five on the charts. ^ As with "He's a Rebel", the Crystals' hit for which it was intended as the follow-up, "It's My Party" was actually recorded not by the Crystals but the Blossoms, who cut the track at Gold Star Studios. Darlene Love says the Spector version was "kinda slow with me and my sister Edna [Wright] singing together on lead. Much more R&B than Lesley Gore's version." ^ a b c d Ankeny, J. "It's My Party". Allmusic. Retrieved July 20, 2011. ^ Tumposky, Ellen (February 18, 2015). "Brooklyn Woman recall origins of Gore's 'It's My Party'". Daily News. New York. Retrieved February 18, 2015. ^ a b c d e f "It's My Party". Cha Cha Charming Magazine. Archived from the original on June 12, 2007. ^ a b Bronson, F. (2003). The Billboard book of number 1 hits (5 ed.). Random House. p. 130. ISBN 978-0-8230-7677-2. ^ a b Shannon, Bob. "Behind The Hits: Stories: It's My Party". Archived from the original on February 6, 2008. Retrieved September 17, 2011. ^ "CBN History". Retrieved February 16, 2012. ^ "Australian Weekly Singles Charts(David Kent) from 1963". Retrieved May 17, 2018. ^ "Official Singles Chart Top 100". Official Charts Company. Retrieved 17 May 2018. ^ "45cat - Dave Stewart With Barbara Gaskin - It's My Party / Waiting In The Wings - Stiff - UK - BROKEN 2". 45cat.com. Retrieved February 17, 2015. ^ "Australia's (David Kent) Weekly Singles Charts for 1982". Retrieved May 17, 2018. ^ "Austriancharts.at – Dave Stewart with Barbara Gaskin – It's My Party" (in German). Ö3 Austria Top 40. Retrieved 17 May 2018. ^ "Ultratop.be – Dave Stewart with Barbara Gaskin – It's My Party" (in Dutch). Ultratop 50. Retrieved 17 May 2018. ^ "Top RPM Singles: Issue 0480." RPM. Library and Archives Canada. Retrieved 17 May 2018. ^ "Offiziellecharts.de – Dave Stewart with Barbara Gaskin – It's My Party". GfK Entertainment Charts. Retrieved 17 May 2018. ^ "The Irish Charts – Search Results – It's My Party". Irish Singles Chart. Retrieved 17 May 2018. ^ "Nederlandse Top 40 – week 48, 1981" (in Dutch). Dutch Top 40 Retrieved 17 May 2018. ^ "Dutchcharts.nl – Dave Stewart with Barbara Gaskin – It's My Party" (in Dutch). Single Top 100. Retrieved 17 May 2018. ^ "Charts.nz – Dave Stewart with Barbara Gaskin – It's My Party". Top 40 Singles. Retrieved 17 May 2018. ^ "SA Charts 1965 - 1989 Songs H-I". Retrieved May 17, 2018. ^ "Swisscharts.com – Dave Stewart with Barbara Gaskin – It's My Party". Swiss Singles Chart. Retrieved 17 May 2018. ^ "Dave Stewart Chart History (Hot 100)". Billboard. Retrieved 17 May 2018. ^ "Top 100 Single-Jahrescharts" (in German). GfK Entertainment. Retrieved June 12, 2018. ^ "End Of Year Charts 1982". Recorded Music NZ. Retrieved June 12, 2018. ^ "Richard Anthony (2) - C'est Ma Fête". Discogs. Retrieved April 23, 2019. ^ "RPM Country Tracks for April 2, 1977". RPM. Retrieved November 14, 2013.